If you ever need something sweet, but don't want to indulge in a full-on dessert, these are a tasty, but healthy alternative. Whether it's an afternoon pick-me-up or an after dinner treat, there are great to have on hand and contain many superfoods like maca, chia seeds & cacao! Even better, they're super easy to make- just throw everything in the food processor, and that's it! Enjoy! Pulse all ingredients together in food processor until well combined. Roll into balls. Coat in extra coconut or cacao, if desired. Makes about 2 dozen balls. These store well in an airtight container at room temperature for a few days, or in the regrigerator for 7-10 days. These chocolate soufflés for 2 are the perfect dessert for date night, Valentine's Day, or any day! 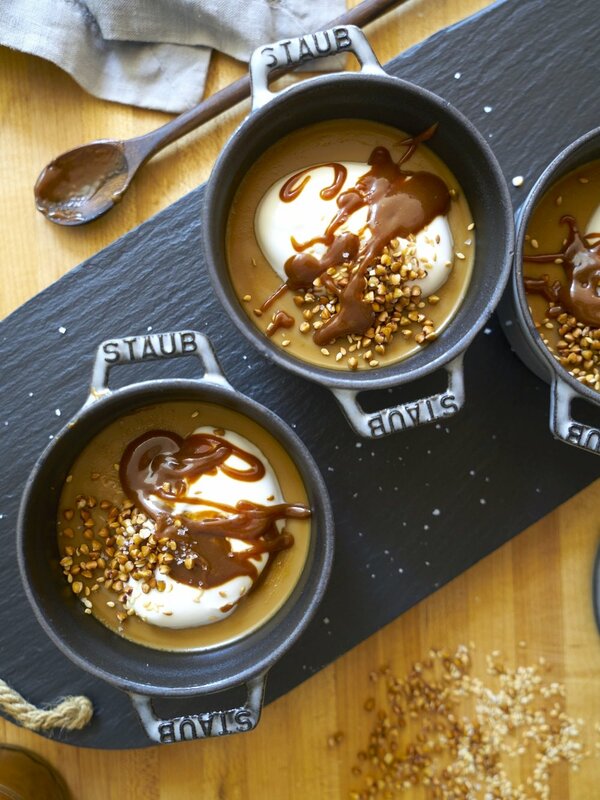 They are served in Staub mini cocotte pots, which makes them look extra fancy too! Although soufflés seem daunting, they can be executed easily with a few staple ingredients, and are guaranteed to impress. Don't forget a sweet & creamy sauce (think créme anglaise or melty ice cream) to drizzle on top! 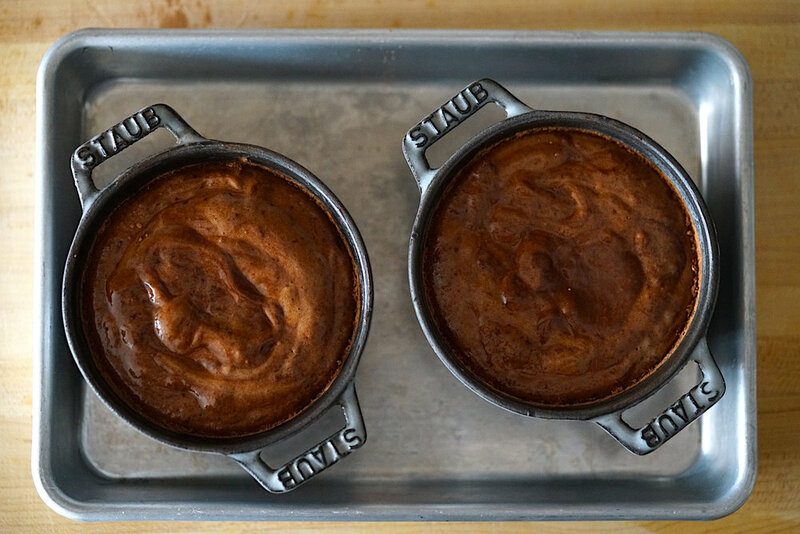 PS- if you want to prep these ahead of time, you can also cover and refrigerate the soufflés overnight before baking! Preheat oven to 375 degrees F. Use 1 tablespoon of coconut oil to grease your cocottes. 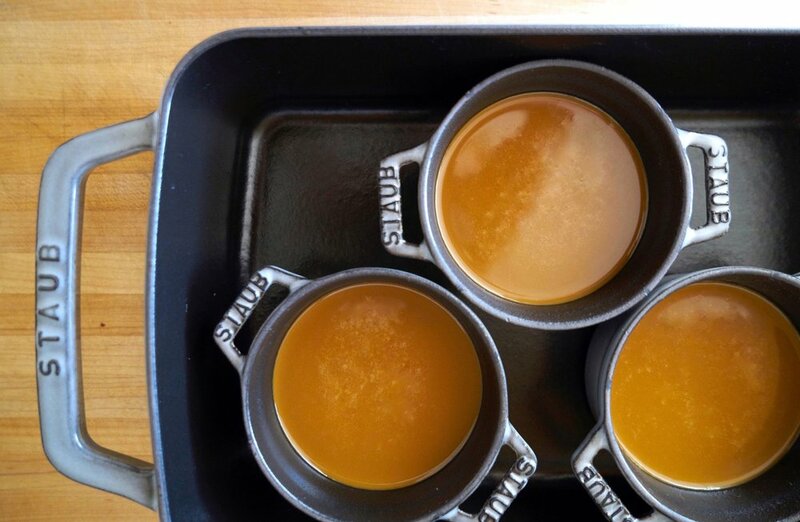 Coat them lightly with 2 tbsp cane sugar, tapping to remove any excess. Place cocottes on a baking dish and set aside. Melt chocolate with 2 tbsp coconut oil over a double boiler, whisking until smooth. Remove from heat and add the vanilla. Whisk in the yolks one at a time until smooth. Set aside. In the bowl of a stand mixer with a clean whisk, beat egg whites on medium speed until frothy, about two minutes. Increase the speed to high and slowly add cream of tartar and remaining sugar, beating until stiff peaks form, about 5 minutes. Take care not over beat. Add 1/3 of the meringue into chocolate mixture. Gently fold in. Add the remaining meringue and fold in until no streaks remain. Do not over mix. Spoon the mixture into prepared cocottes. Place in preheated oven and bake for 18-22 minutes. Sprinkle with powdered sugar and serve immediately, topping with créme anglaise or salted caramel sauce. *Adapted from Chocolate Soufflé by Real Simple.